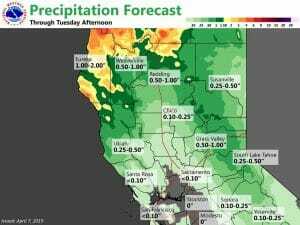 April 7, 2019 – Storm track will remain well to the north affecting areas of northwestern California. Scattered showers are possible over the mountains, mainly north of I-80. Another system will impact the region Monday into Tuesday with snow levels dropping to near 5,500 feet on Tuesday as the storm exits. Early morning water vapor imagery showed enhanced mid/upper-level moisture streaming east-northeastward toward the California/Oregon coast. 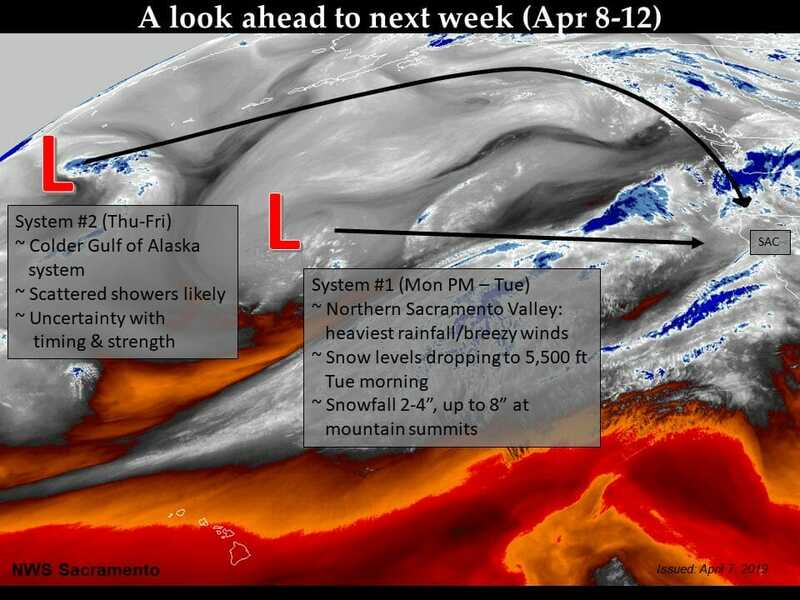 This northward shift in the Pacific jet has generally focused any meaningful precipitation up toward Shasta County. Fortunately this should remain north of areas west of Redding which received 3 to 5 inches of rainfall the past 48 hours. Eventually the offshore pattern will amplify as a shortwave accelerates toward Northern California on Monday. The shield of precipitation will expand southward although expected amounts are quite limited from Sacramento southward. While northern Shasta County can expect a brunt of the precipitation through Tuesday, orographically enhanced numbers are likely over the Sierra-Cascade ranges. 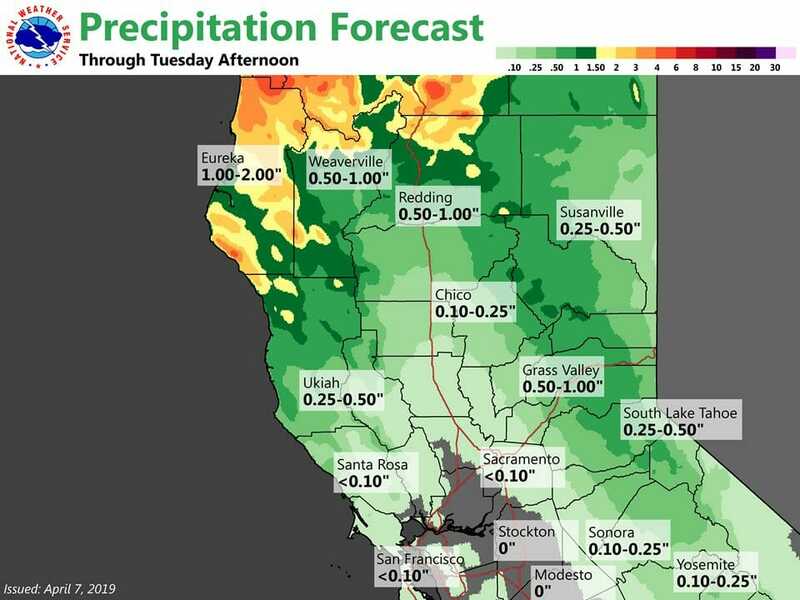 Over the former region, 2 to 4 inches of additional rainfall is in the forecast as the moisture plume remains fixed over far northern California. Additionally, breezy conditions are likely over the far northern portion of the Sacramento Valley. Regarding mountain impacts, snow levels will begin quite high, generally in the 7,500 to 8,000 foot range. By Tuesday morning, they will come down considerably as colder air aloft moves inland. At this point snow levels should near 5,500 feet which may lead to brief travel impacts with any passing snow shower. It will prove to be a showery day given some elevated instability in place. The forecast will need to be monitored for any thunderstorm potential. 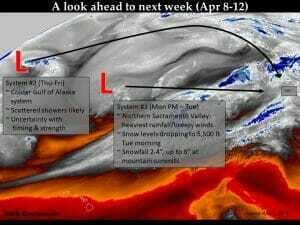 Rapid improvement is anticipated by mid-week as a flat upper ridge sweeps through the western U.S. This will bring Valley high temperatures back to being slightly above average for early to mid April. However, the warmest readings should occur the next couple of days with highs in the upper 70s over the upper San Joaquin Valley. Ensembles continue to be in reasonable agreement indicating an amplified pattern featuring a trough over the West with a ridge over the eastern Pacific late in the week. Embedded short-waves in the northwest flow will bring occasional showers to mainly the mountains. Overall, precipitation amounts expected to be light. More widespread precipitation possible beginning late next weekend as flow deamplifies. Temperatures will be close to average for mid-April.